There was once a time in France when the Mime was loved by all. After worldwide acceptance, however, it seems the Mime today is an endangered species being misinterpreted by public misconception. There are even hate sites on the Internet devoted to the Mime. Of course, Mimes everywhere have remained silent about this disturbing trend but have resolved to take matters into their own gloves. The performance of pantomime originates at its earliest in ancient Greece. 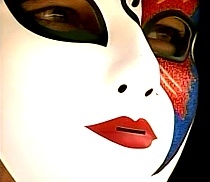 The name is taken from a single masked dancer called Pantomimus who told a story in total silence. Modern Mime bases itself not only upon silence but also the invisible. Whether it's a box, a wall, or an immovable object, the Mime behaves just as if the invisible actually exists. This is what makes the performance believable. Attributes such as weight and size are important parts of Mime. The more the Mime can portray real objects, the better the Mime can communicate a story. One way to make the general population more aware of the art of Mime is through the performing arts and forming local support groups. Being a misunderstood misfit, the Mime today still struggles to get the word out. "Mimes need other Mimes", said Zoobie, a Mime on Boulder's Pearl Street Mall, "in order to further learn and understand Mime. They may grow and even flourish but it seems they need a huge base population to even survive. In a city of ten million, there may be only ten Mimes. You can now see how rare they would be in small towns." Re-inventing themselves, the Mime gaining the most popularity today is the Human or Living statue. These costumed entertainers stand perfectly still and remain silent only to move when a coin or note is dropped into the hat. They can move slowly, robotically, or even wildly dance only to return to their inert state. 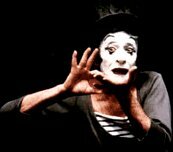 Marcel Marceau once said, "Never get a Mime talking. They won't ever stop!" He also noticed that other Mimes copied his routine without any regard to context. They would, indeed, be "trapped in a box" but without explaination of how they got there to begin with. The complete telling of a story in pure silence was Marcel's forte born from his childhood love of the silent cinema era. That was Miming - Oh so fine! In the Merry merry merry month of May!